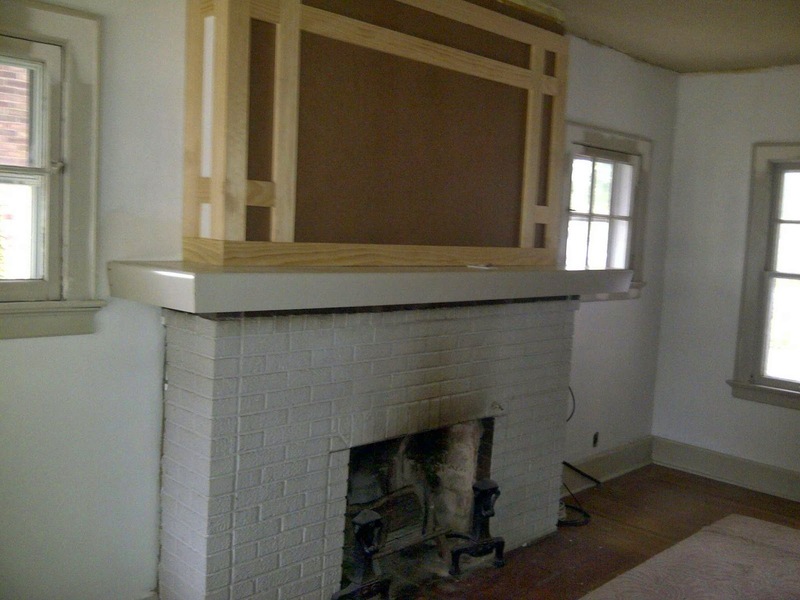 The fireplace needs a little updating. We discovered from the inspector's report that the fireplace could no longer be used due to the interior damage of the chimney. I wanted to keep the original look but add a more craftsman style feel to it. Finally came up with a design that will fit perfectly for this large brick fireplace. First, I called in my handyman/carpenter which happens to be my dad. Yes, I have a family who happens to be handy and crafty and has had lots of experience renovating multiple homes... just what I need! Very blessed . 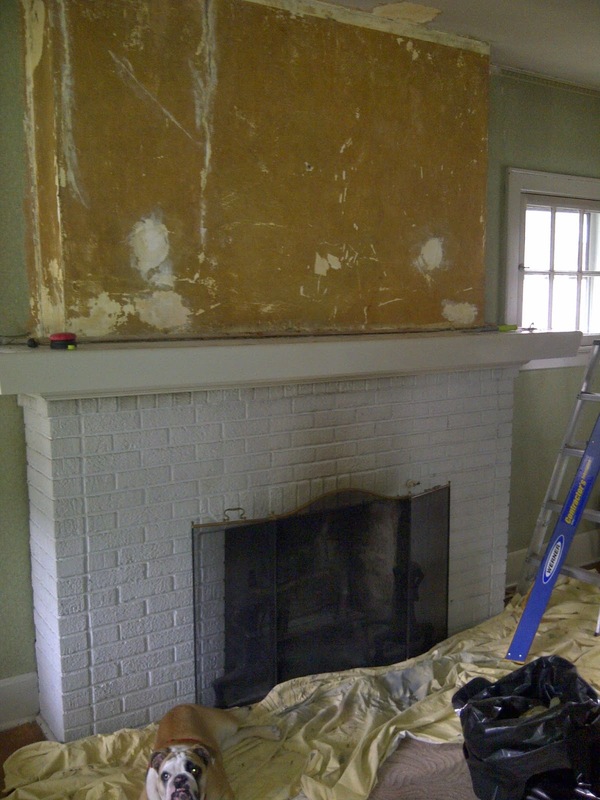 First, we need to patch and cover the huge crack in the wall above the fireplace and any other holes. The two white circles were actually where two sconces hung at one time. They covered these up with the second layer of wallpaper. Then, he put up a ¼ ” thick melamine board to make sure there is a smooth base surface. Next, he used 1 x 4's (the 1 x 6 seemed too wide) to create the unique windowpane design below. I designed it this way to frame out a large screen TV that will eventually be mounted above the mantel. Notice the walls are white and not that yucky brown with a whole bunch of cracks? The white is actually a fresh skim coat of plaster. We started to skim the walls in here because they weren't in too bad of shape. 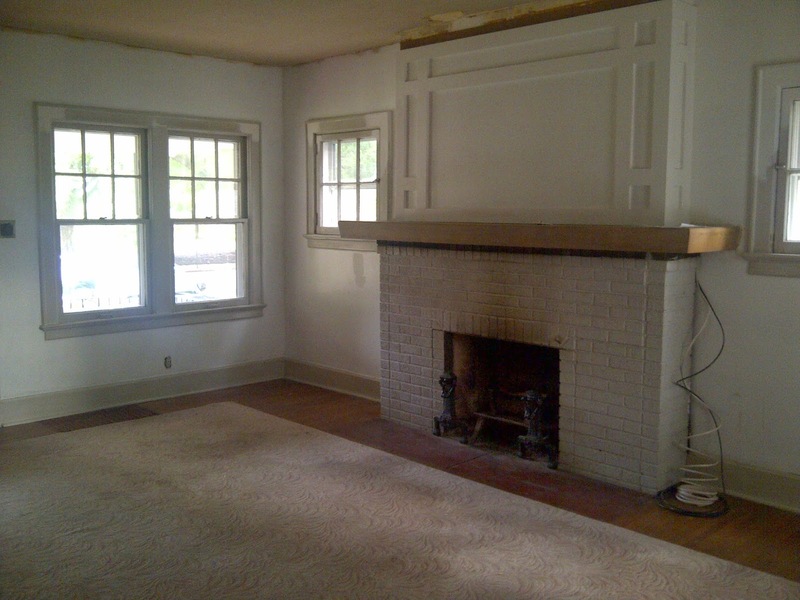 Whether to strip the fireplace mantel or re-paint it is the next question? I like the look of an exposed wood mantel with a painted brick. It's good to use multiple textures and different design elements in a room, creates a focal point for the eye. A smooth wood surface with a rough brick is my kind of taste! So I took the risk not really knowing what the color of the wood or the condition it would be…could always stain it. Using a paint stripper and a scrapper, my mom stripped two coats of paint off of the mantel. The wood is beautiful and in mint condition! All it needs is a little sanding and a clear satin poly coat finish to protect it. The fireplace is primed and ready for paint. Follow a long to see what happens next in this house renovation! Thanks!